I've been all consumed with ongoing projects lately which is great, I am enjoying them all immensely - using great yarn and mindless back and forth or round and round hooky - no thought required. I do like a challenge though and a good pattern to follow, seeing all the numbers work out into something fun. 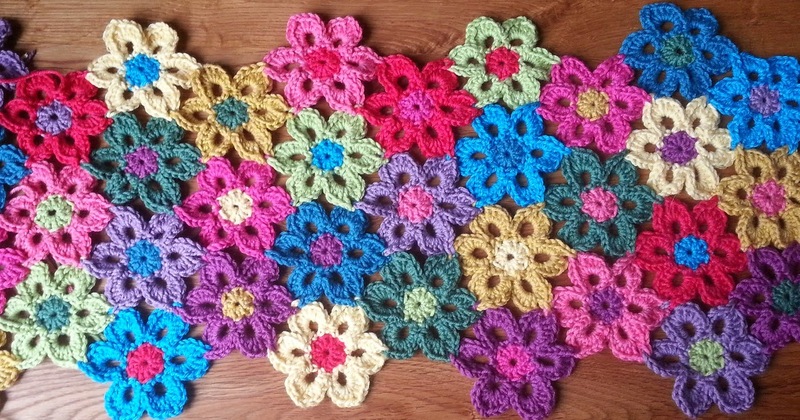 I needed a break from the mammoth task of edging and decided to have a bash at filet crochet! It's something I have wanted to try for a long time and there's no time like the present! I read up about it first as the principle of it is very simple, I just needed to know how to get started. Wikipedia says that filet comes from the French word for mesh. This makes sense as all you are doing is working from a grid with open or 'mesh' spaces and closed spaces. The grid really can be of anything and you are only limited by your imagination. However I didn't really have time for imagination, I was too impatient to get started and see how it all works to draw up a design. 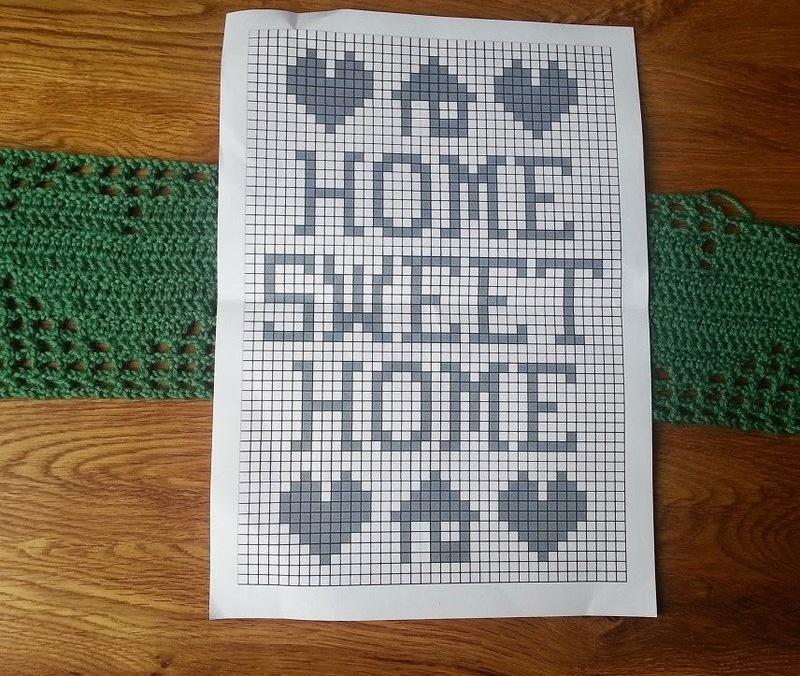 I found a simple Home Sweet Home grid on an image search and printed it off to get started. Traditionally these peices are made with fine white cotton yarn. I wanted something a bit brighter than that and this was only a test run, so found a 50g ball of a green wool/acrylic mix. I soon discovered the reasons white cotton is used, it isn't elastic at all (my wool was) so it lies nice and flat with no puckering (mine is a bit curly). It clearly shows up the design too (my wool is a bit, well, wooly so the design isn't as clear). I had thought of trying to change colours so the images stood out more but this proved too difficult for a beginner at this to master so I gave that a miss after one failed attempt, a job for another day. ahh my eyes! So much sewing today and I am really struggling to see straight now. I had nine little squares to make to finish the edging for my blanket and then sew in all the ends and then sew them all into two long strips. There were other things I should have been doing with my Saturday but I am so close to finishing now that I haven't been able to put this down all day. Pah, housework can wait until tomorrow. 36 of these all done. What a relief! 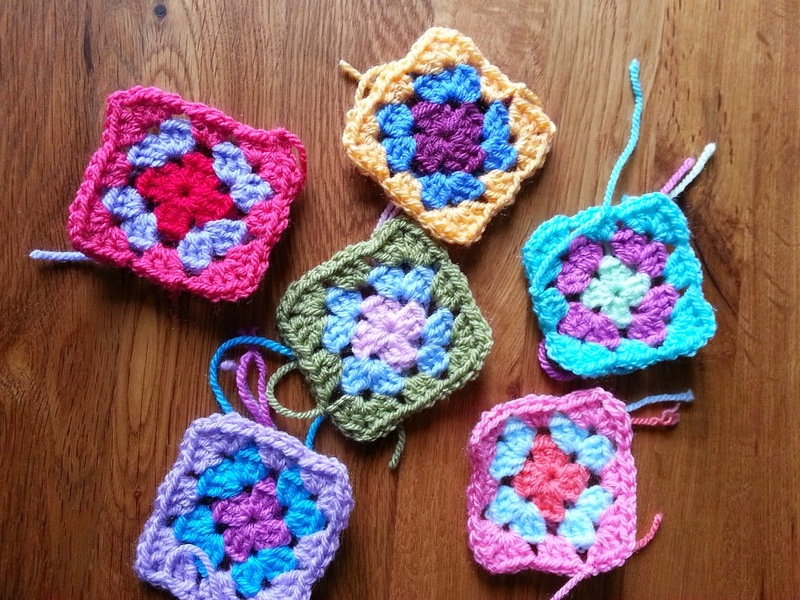 Granny squares are not my favourite thing to crochet but I have persevered and got there in the end; by the mid-twenties I took it as a personal challenge to get them done, I would not be beaten! Worth all the effort when I see them all together looking so cheery and colourful. 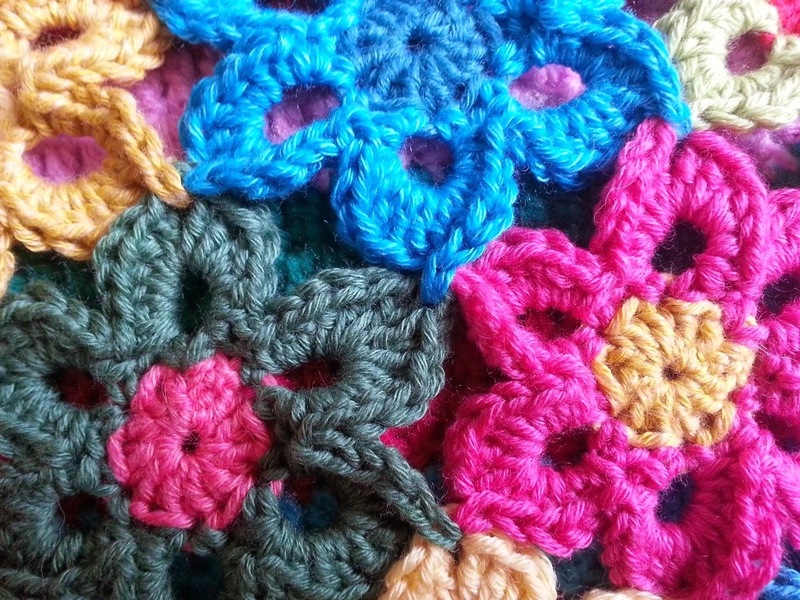 Would make a nice cushion too I think, would go nicely with my blooming flower cushion (another pattern from Lucy at Attic24). Post holiday blues well and truly set in this morning. I was moping around the house, annoying the cat who just wanted to sleep (but I was bored so kept fussing him and talking to him - crazy cat lady!). It's not that I haven't got plenty to do to keep me occupied, I just didn't want to do any of it. I realised that I haven't really left the house since the weekend, only to pop to the shops and here and there so I decided to spend the afternoon sorting out my litte back garden, don't those weeds grow fast! It did the job and the sunshine lifted my spirits nicely. When we bought the house, seven odd years ago, I started the garden from scratch. As funds were tight everything that got put in it was a rescue-a-plant-from-wilkos job; half dead, cheap and very small. 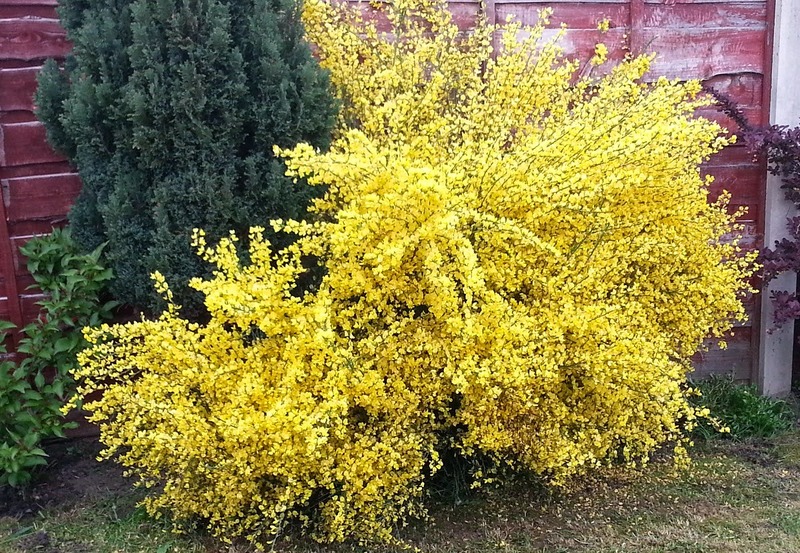 It has taken some time but my broom has finally decided to grow a bit and is set to take over the whole garden. I don't mind though, I love that it is so big and brash and showy. I found this little fella hiding behind it, I have no idea what it is, perhaps you can enlighten me? But it had to be moved so I dug a hole next to the new cherry tree and plonked it in. I'm sure I should have done something first, like prepare the ground with compost and other stuff but it will either live or not and it only cost a quid so I'm not too concerned. 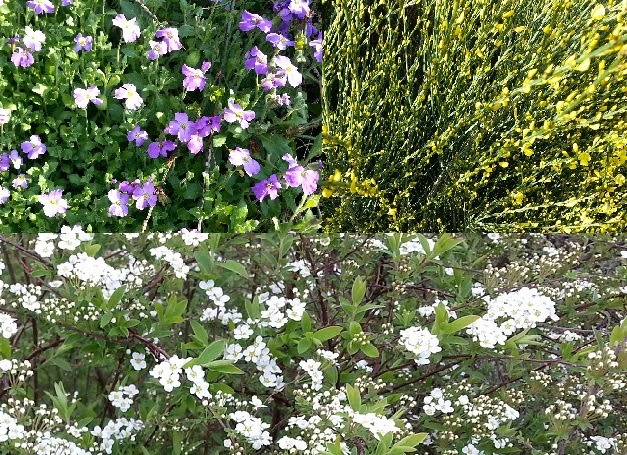 My 'plonk it in and see' approach to gardening seems to be working, mostly. Three hours later and things were looking much better out there and my blanket started calling me. I finally sorted out the ends yesterday and it only took a couple of hours. As I said before, thinking about doing them was much worse than actually doing them. I hadn't got my sums right with the little squares that I will be edging it with, I need 19 at each end not 15. I have made half of them and started sewing them together into a thin strip. 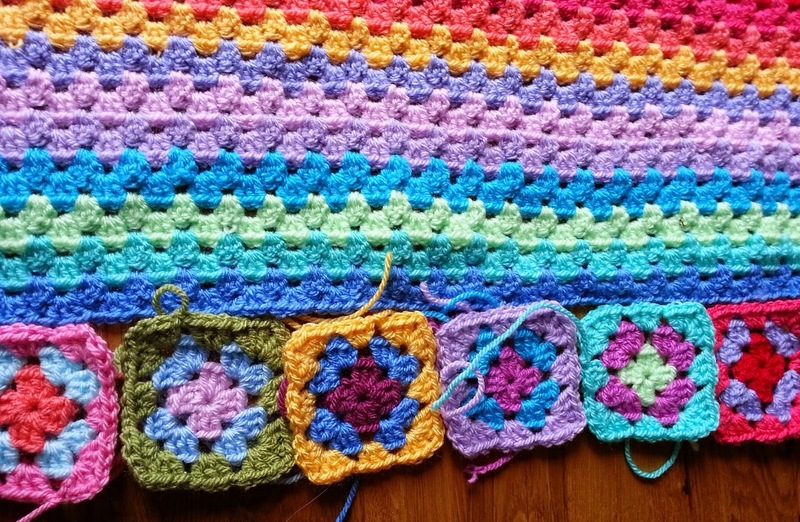 I will probably crochet them on to the blanket but decided a whip stitch through back loops would be best for joining them together. 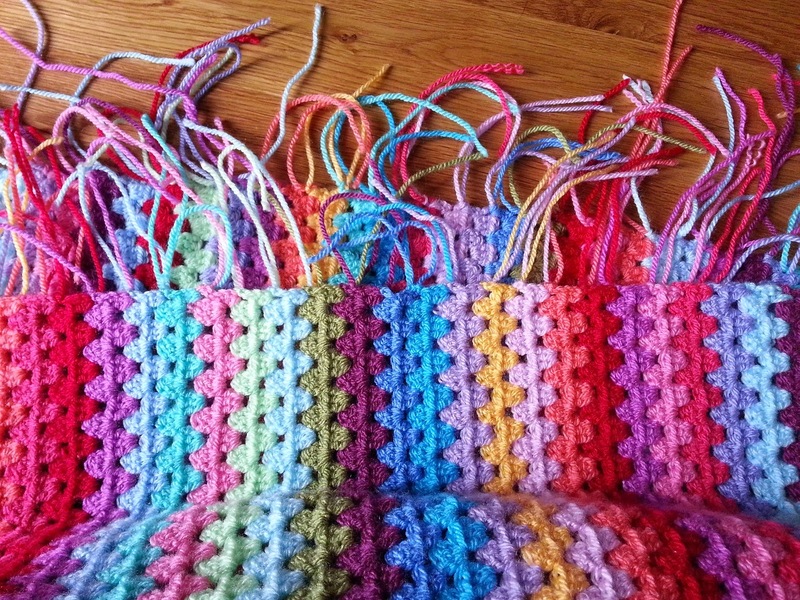 I think the joy of finishing crocheting a big project is always spoilt by the task of sewing up. 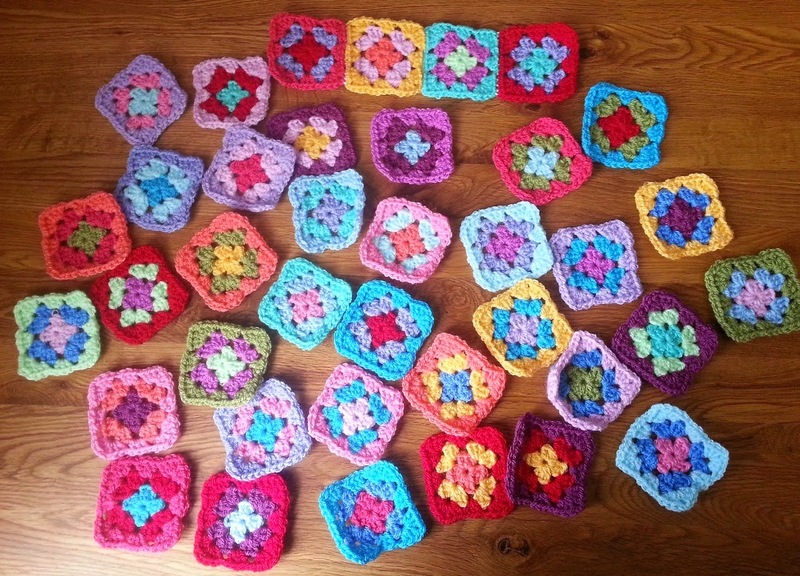 I had good intentions of sorting out the ends for my granny blanket as I went along but it didn't happen, of course. So I am left with this, every single one of these needs to be sewn in. Great. But as with most things, actually doing it won't be as bad as the thought of doing it, I hope. 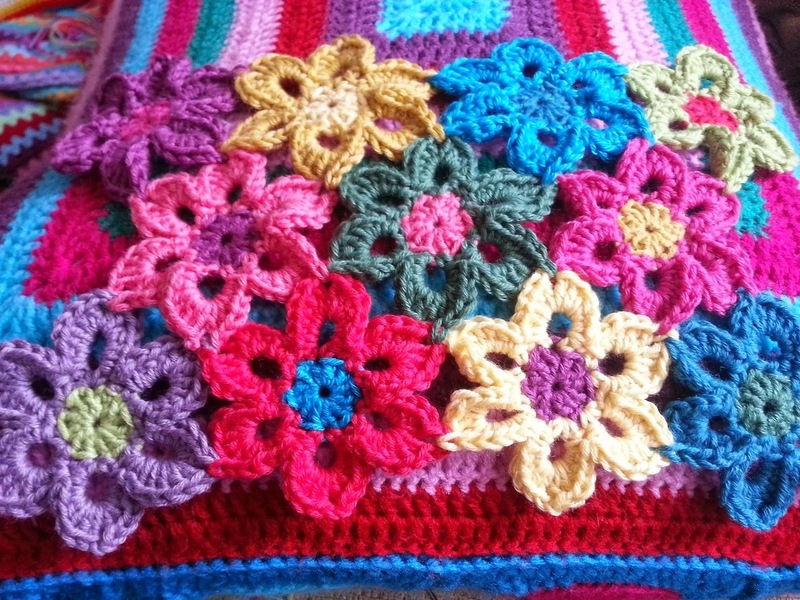 I have decided to edge the top and bottom of the blanket with little granny squares. If I have done my sums right, that should be 15 squares at each end, IF I have done my sums right. It should look quite effective I think. 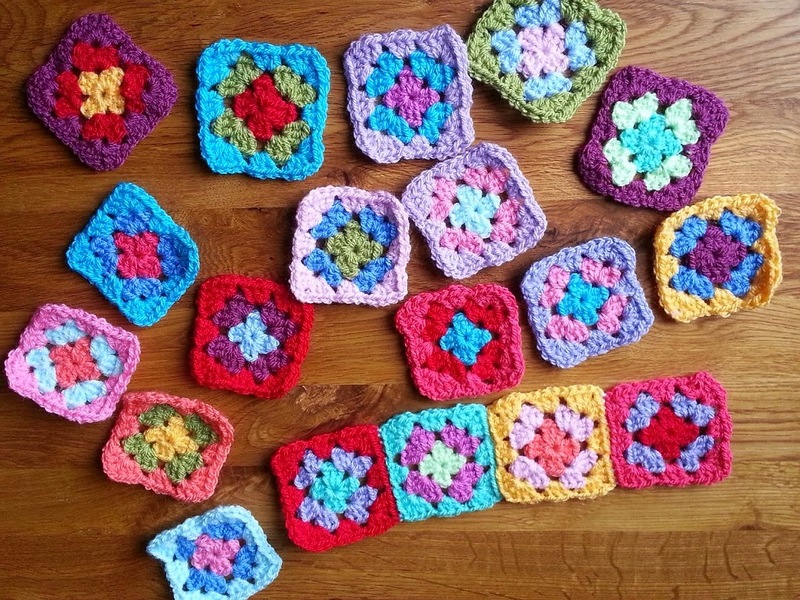 I am then going to finish the lot with some sort of border, still not decided which one yet but I have lots of ideas. In the mean time I am back to sewing in the endless ends and hooking up more little squares. I am really enjoying that bit as I sit on my sofa watching the rain come down outside, it has turned really chilly out there and this blanket is already keeping me warm and cosy. Hello and I hope you are having a happy Easter. We got back from our week away in beautiful Cornwall yesterday. The drive is a very long one but we are used to it by now as we go twice a year. As soon as we take the short walk from where we stay down to the beach and take in the fresh air, big sky and the amazing view, it is all worth it. We have a little routine when we are away which usually includes finding somewhere new to go at least once in the week and the pub-of-the-day hunt for food and beer. 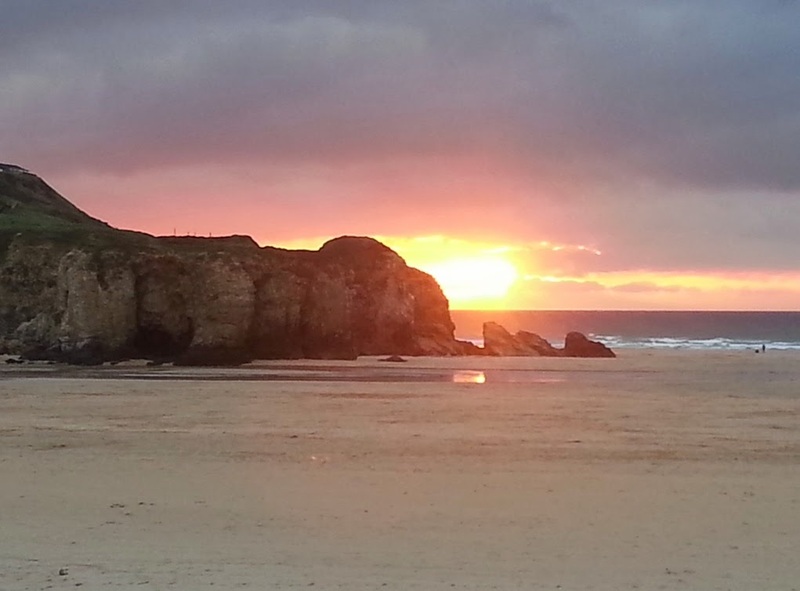 This is the view from one of our favourite pubs, the Watering Hole on Perranporth beach, perfect. 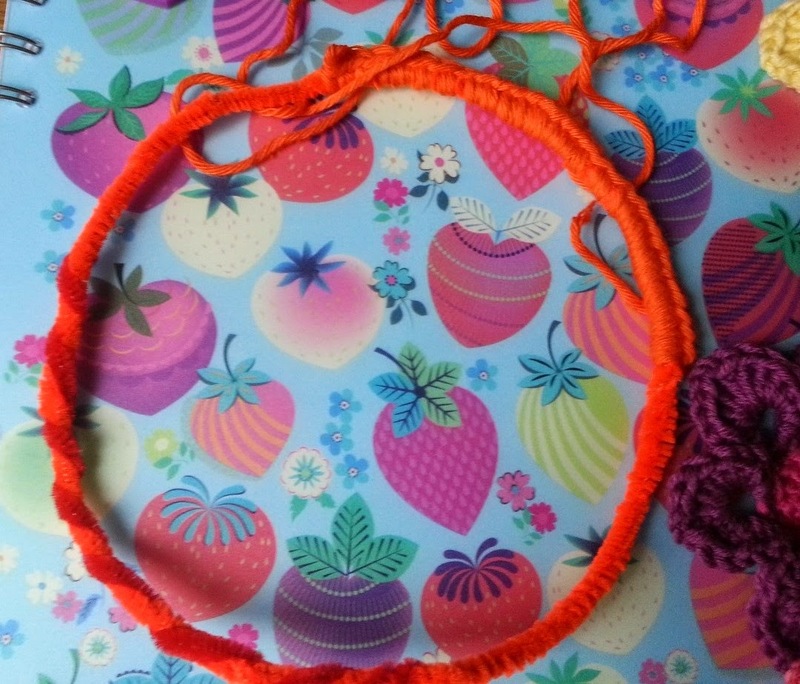 Holiday hooky was high on my agenda, I had intended to crack on with my flower shawl but sometimes you just get caught up in something else and other things have to take a back seat. 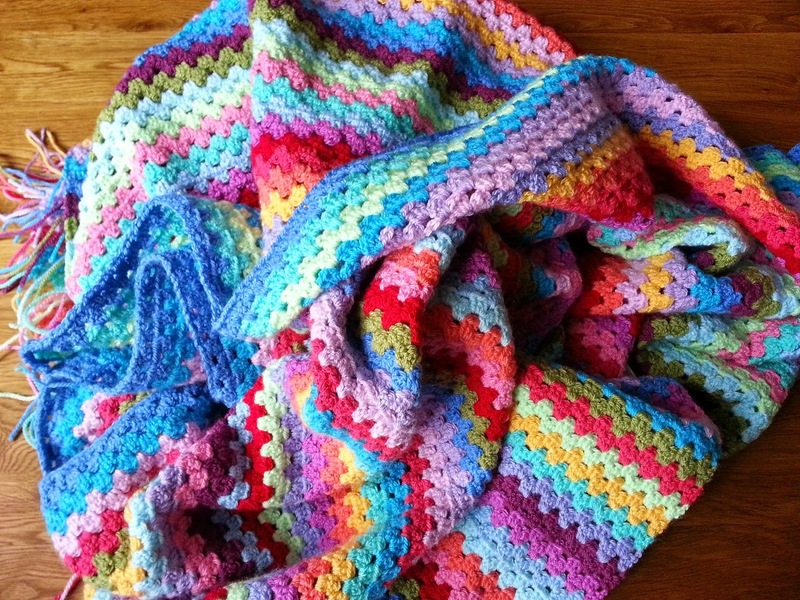 My granny stripe blanket was just so much fun and I whizzed through the rows. The result is that I have finished my granny striping! The blanket is not finished as I want to give it a big chunky border but the body of the blanket is done, the last 12 inches or so were so much fun I really do wonder why it has taken me so long. to wait and ordered one from amazon. 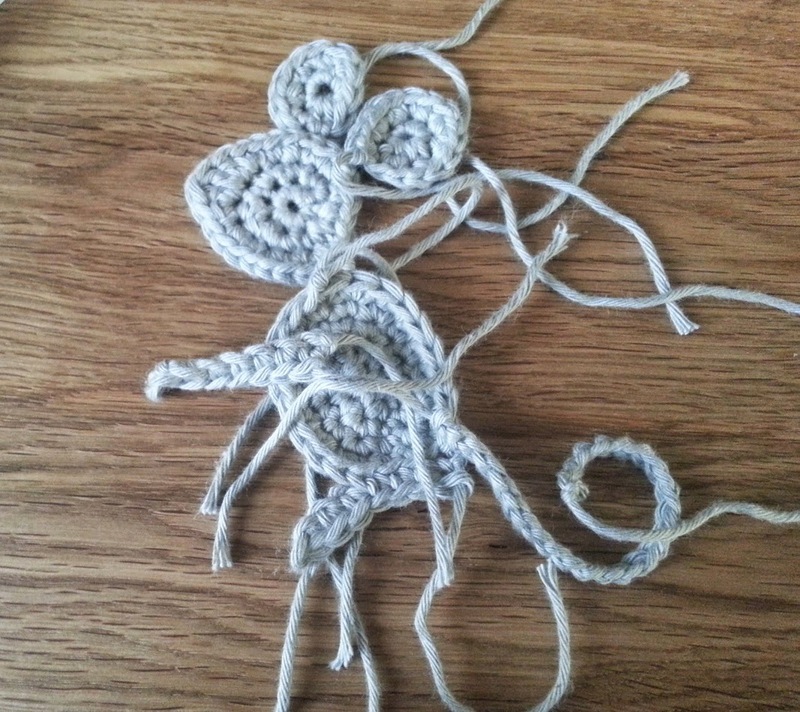 So the mouse is on the back burner and on with other things. 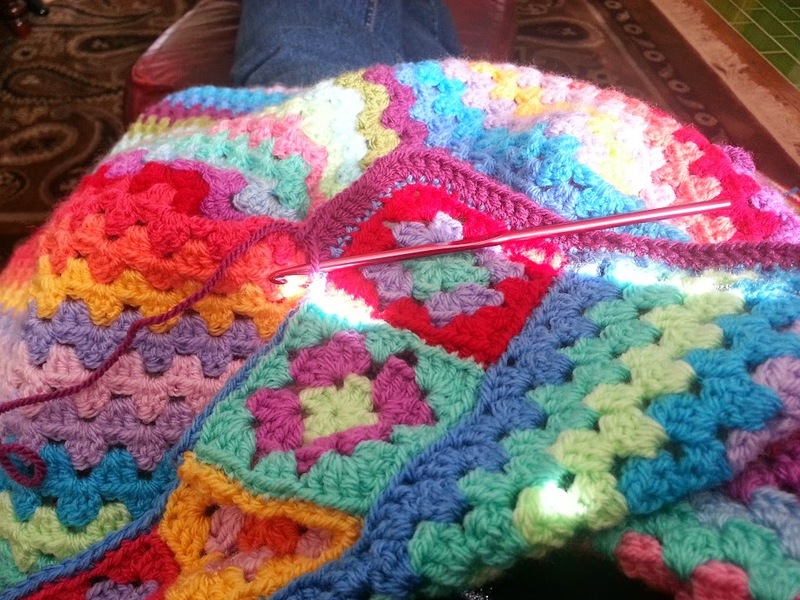 I still have my granny blanket on the go - I know, it is taking forever! 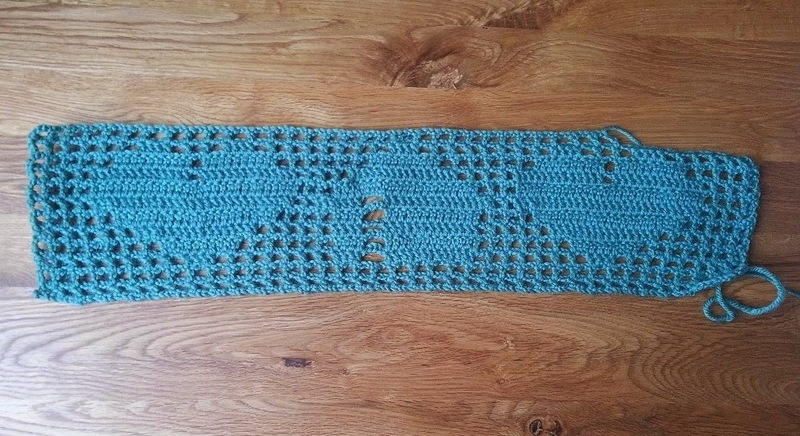 but I've looked at a friend's blanket to the same pattern using the same yarn and my tension really is tight, no wonder it is taking so long to grow. Of course it doesn't help when I keep stopping to make other things. My shawl is number one priority at the moment and is coming with me to Cornwall next week (can't wait!). Unfortunately it won't be finished, I've just got too much other (boring) stuff to do before we go but that's fine, I am really enjoying the process and that is the most important thing with crocheting or any craft. Monday again, don't the weekends fly by?! Even in my currently non-working state the weekends seem to pass in the blink of an eye. I thought I would get loads of crocheting done on my shawl this weekend but it just didn't happen, I did some but not as much as I had intended. 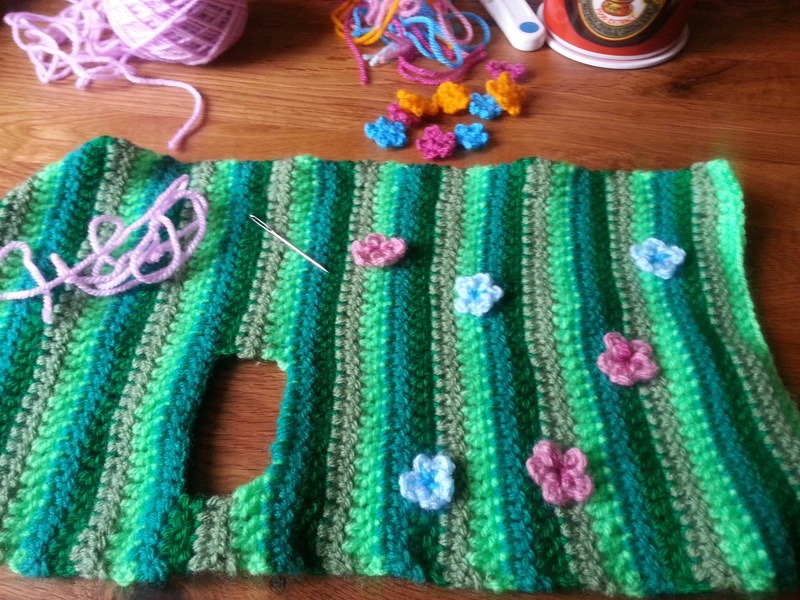 It is coming on though, I'm getting close to having the width I want and I've got some ideas about how I want it to eventually look, but for now it is steadily growing and I am very happy with it, it is just so cheerful! So yes, sidetracked. I have been hit by lots of ideas all at once and so I had to put down the shawl and quickly cobble one of them together. Today has been a battle between me and the cat. He is the noisiest cat I have ever known, he really does not shut up! All he wants is my undivided attention constantly and as much as love the little fur ball I have other things to do! as well as the constant whinging all day he is molting, there is cat fur everywhere but happily the one thing that does shut him up is the vacuum cleaner - he is terrified of it and flies out of the cat flap as soon as I get it out. So that has been my day, cleaning, shopping, washing and no hooky time at all. All that boring stuff is done now and I have the whole weekend ahead of me to get on with my new project! 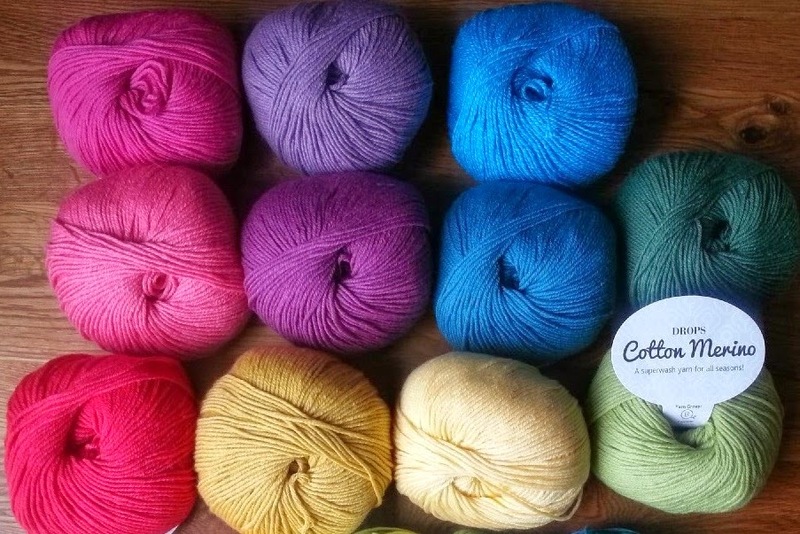 Ah my lovely new yarn is so wonderful to work with. 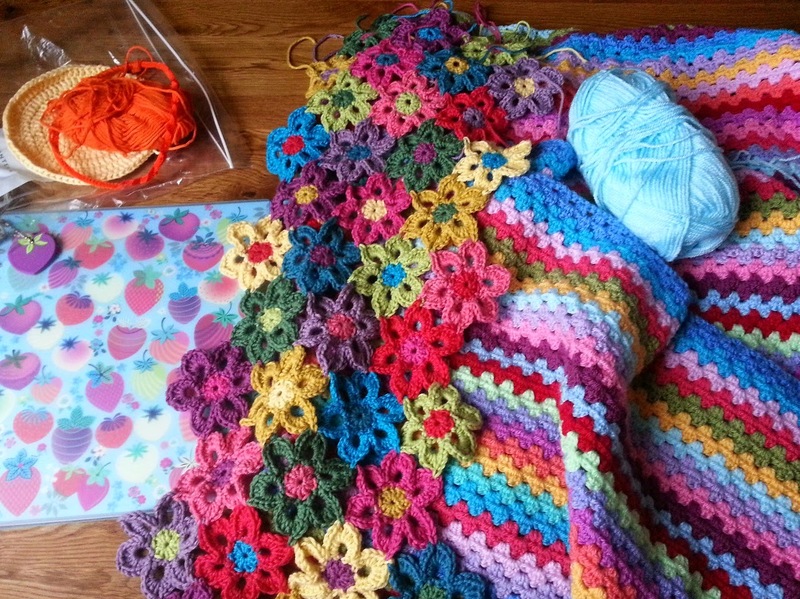 I spent most of yesterday trying to decide what to make with it, I settled on a flowery scarf/shawl/small blanket. We are off to Cornwall for a week soon and it will be nice to have it to wrap around my shoulders if it gets a bit chilly on one of our many walks across the dunes and beaches. If it isn't finished in time it will good to take with me to do while we are away, I like to have something to crochet on holiday. 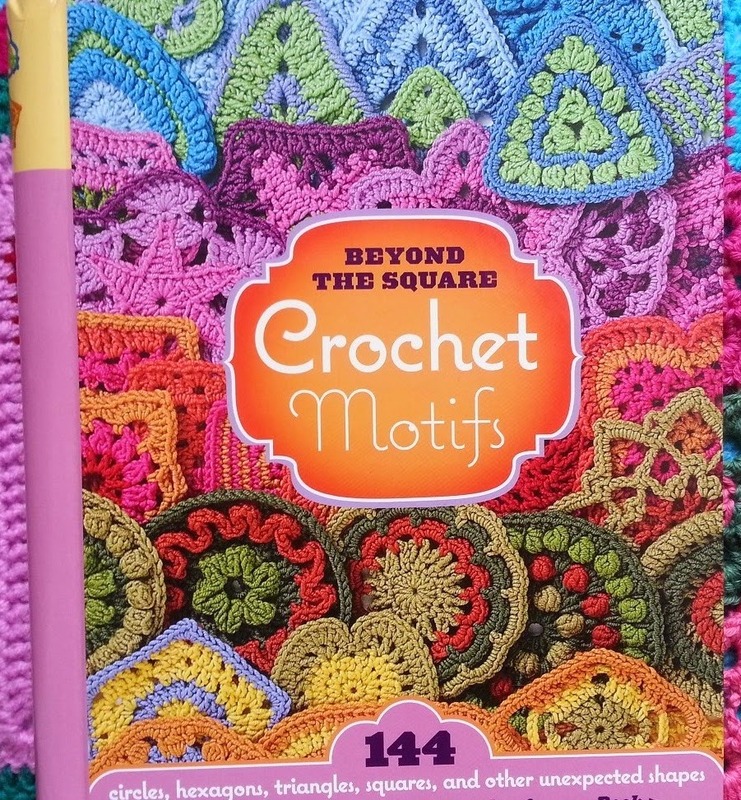 I bought this book quite a while ago but haven't tried anything from it, I do like looking at it though it is so pretty. Isn't it pretty?!!! 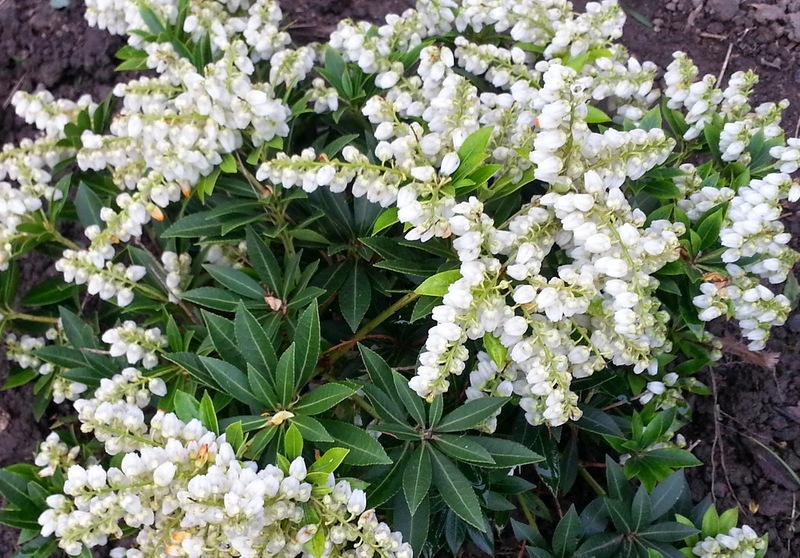 I love it, it is so soft and cheerful and is growing fairly quickly, so you never know, it might be ready for my holiday afterall. Can you see there with the turquoise flower how the end of the petal is a bit twisted? You always get an element of that with joining as you go but I hope with some blocking and a gentle press with the iron it will sort itself out. I will take more care joining now that I know this might be an issue. Good afternoon! I am having a very good day indeed which is surprising considering how little sleep I got last night (must remember not to drink coffee after lunchtime! 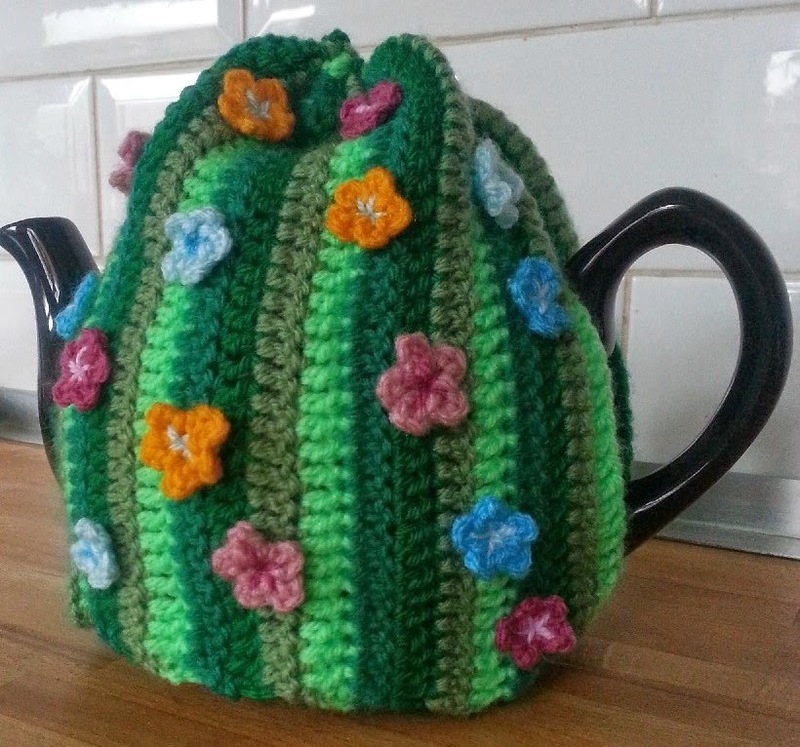 ), so I have finished off my tea cosy and I think it has turned out very well for a made-up-off-the-top-of-my-head thing. I had finished the actual cosy last night, 40 rows of trebles, 35 stitches a row and a gap half way for the spout. I neatened up the spout hole with a quick row of loopy-roundy (?) stitch and gave the edges a press to flatten them, you can see they are a little puckered from where the ends are sewn in. To make the hole for the handle I just left a gap big enough for it to comfortably fit through when sewing up the side, about 20 stitches. 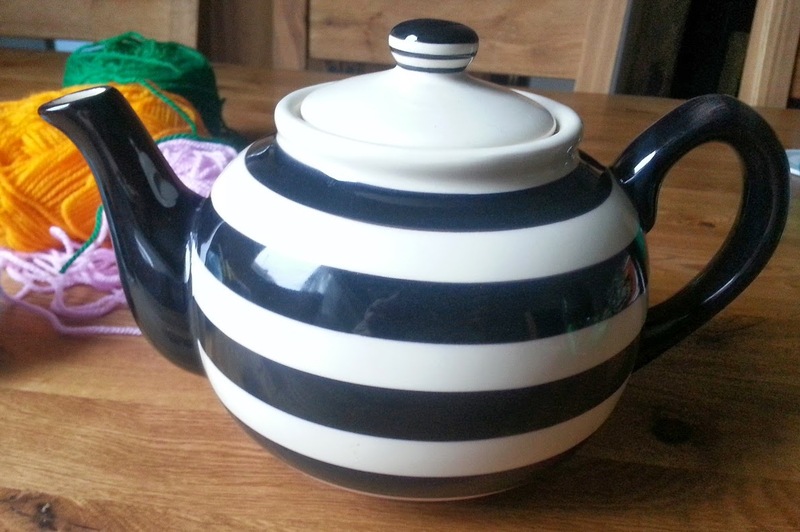 My teapot is a normal roundish one so it should fit any that are similar - which is good considering I nearly dropped mine three times while fitting the cosy on. As my inspiration for this cosy came from sitting out in my little back garden yesterday in the sunshine, I decided to put little flowers all over it and call it my Spring Garden Tea Cosy. 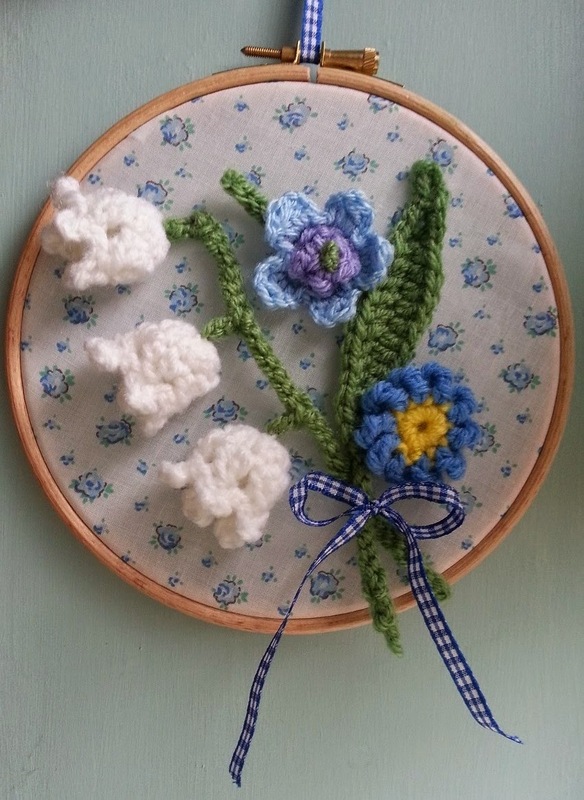 The flowers are very simple to make, start with a magic ring, chain four, slip stitch into the MR and repeat four times (so you have five petals). Sew the ends in and sew a contrasting colour in the middle. ahh isn't it pretty! I did start losing patience sewing the flowers on so some of them are a bit rough and ready or 'homespun' but I quite like that, it makes me smile to look at it. 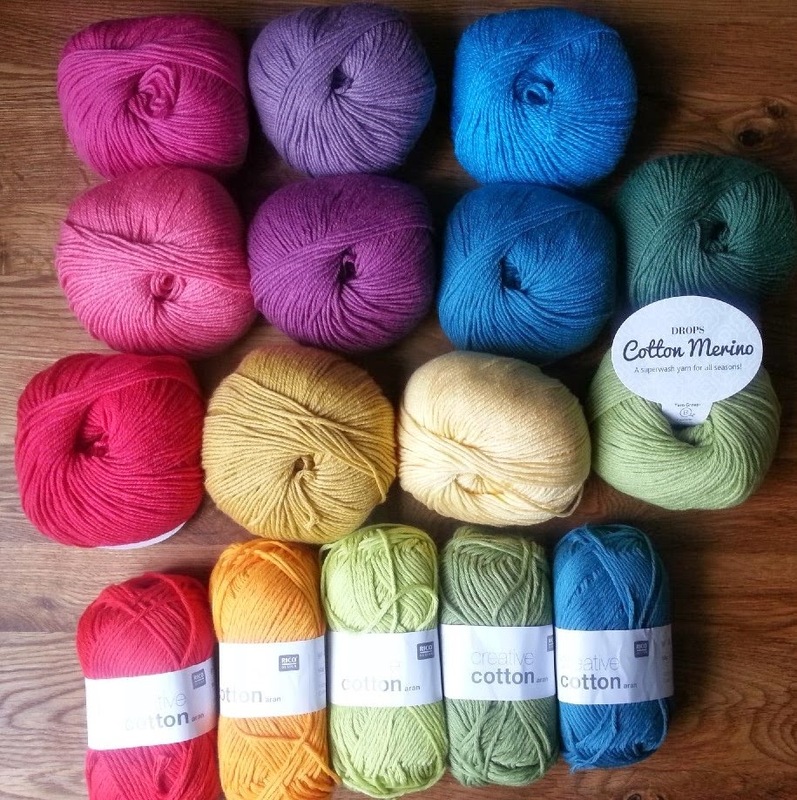 I had ideas of maybe putting a butterfly or two on the top but that isn't going to happen for a while as my new yarn arrived today!!! Eleven ball of beautiful Drops cotton merino and five balls of Rico Creative cotton to replenish my dwindling supply. As i mentioned yesterday, I hadn't any idea what the Drops would be like, but it is oh so soft and bright and pretty and gorgeous! This picture really does not do it justice. I now just have to decide on what to make with it, can't wait to get started, every time I look at it I start grinning! Last week I spent a couple of afternoons trying to sort out my yarn shelves, it took some doing but I finally got them all nice and tidy. Somewhat depressingly it showed just how much, or how little, I now have. I started this year with a promise to myself to seriously shrink my yarn stash before buying any more, I have done a better job of that than I had expected! So yesterday I bit the bullet and ordered more, I really can't wait for it to arrive and I have just had the dispatched email so crossing everything in the hope that it will turn up tomorrow. In the mean time I really needed something to make today, that would be finished before my order arrives (as all will be forgotten for a while then) and something not too fiddly to take to the knit-and-natter group this evening. 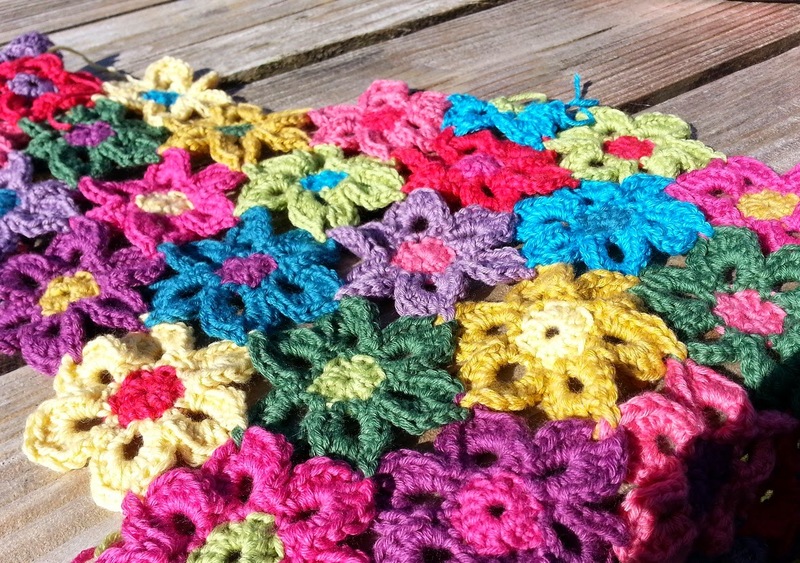 I was sat in my little back garden enjoying some rare sunshine, drinking tea and decided to make something green with flowers on, but what? Well as I am drinking so much tea nowadays I really need a tea cosy. My good friend Jen knitted me a lovely Christmas tea cosy last year but I could really do with one that is a little less seasonal. 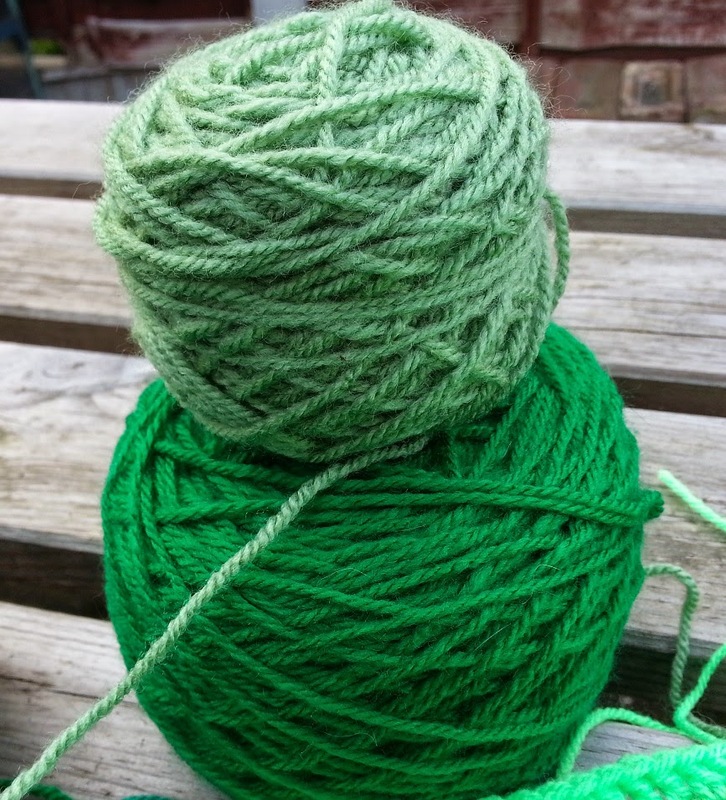 During my epic tidy up last week I used another Christmas present, my yarn winder. 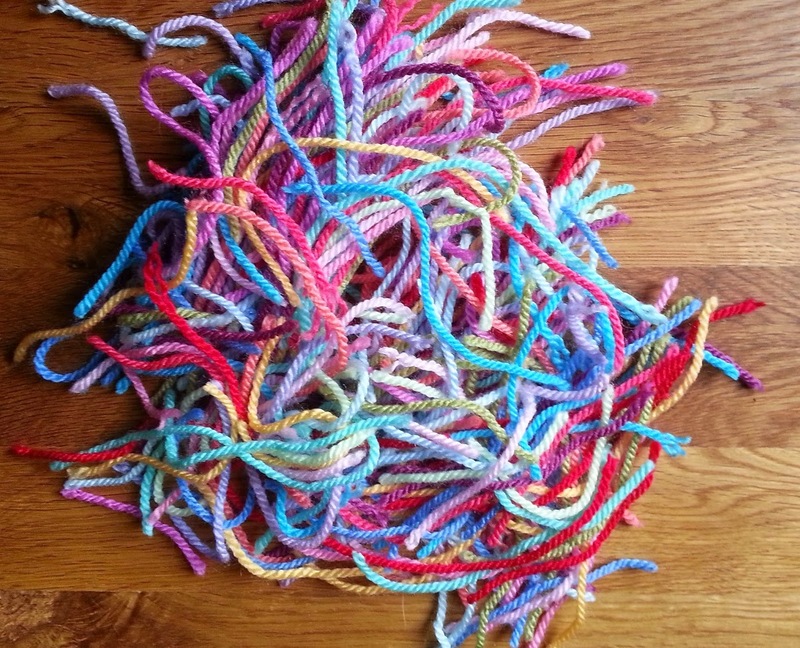 It is so much fun to use and miraculously turns big lumps of mess into lovely little yarn cakes. 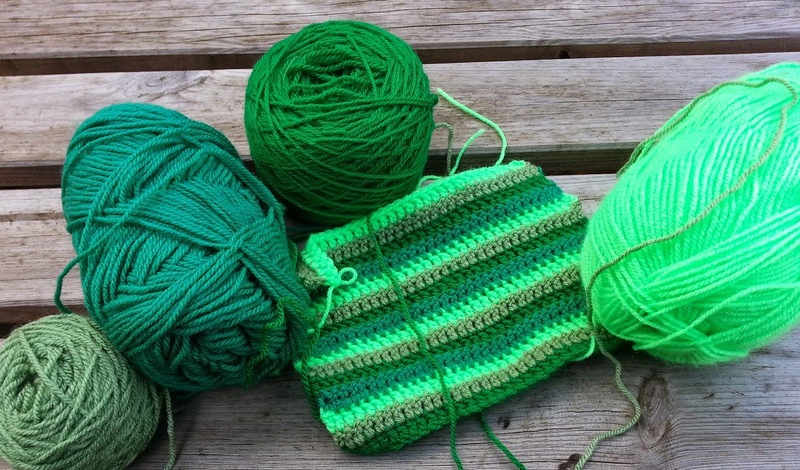 I didn't carefully select the colours or anything, I just grabbed four different greens and started hooking up rows of trebles, roughly measured against the height of my teapot (the stripes will be going vertically). It was also a good way of using up these scraps and a lurid neon green that I got from somewhere, it tones it down a little having it next to the earthier greens. Unfortunately I have had to stop there as there are still a couple of hours before knit and natter and I am nearly half way through the bulk of this, sort of defeats the whole purpose of it. With a bit of luck I will get it finished this evening and then it will just need some flowers and a drawstring to tie up the top.